BitDefender is trying to strike a balance between security protection and speed with its small home office software, and selling it at an affordable price starting Aug. 17. The Bucharest, Romania-based security vendor doesn’t have a well-known brand like Symantec Corp. or McAfee Inc. and it seems to know it. It prices its software suite to be about 15 to 20 per cent less expensive than those brands, and promises reliable security that won’t bog down your computer’s performance. Its software will be available in three packages – Antivirus Pro 2011, Internet Security 2011, and Total Security 2011. The latter package includes all the trimmings of a modern security software suite, including file encryption, back-up and a “tune-up” feature. BitDefender’s home screen can be customized with different short-cuts. To BitDefender, speed and security is a binary relationship – if you have more speed, you sacrifice security. 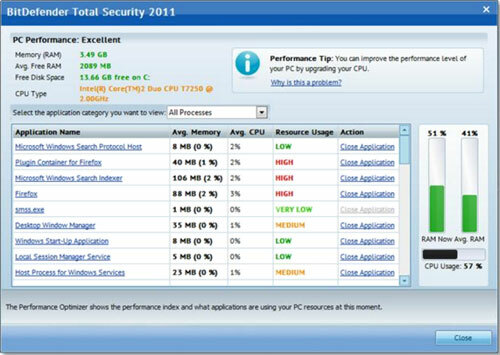 If you have more security, you sacrifice your system’s performance. It has tried to strike the right balance, and points to results from AV-Test.org to illustrate this. BitDefender causes Windows 7 to boot 3 per cent slower, and Microsoft Word to load 4 per cent slower. That equates to a few seconds faster than the industry average, says Carmen Maierean, senior product manager at BitDefender. Computer security really does come at the sacrifice of some performance, agrees Charles Kolodgy, research vice president for secure products at analyst firm IDC. Intrusion detection and gateway check-ups will tax the CPU. BitDefender’s Quick Scan feature runs in less than one minute. It relies on BitDefender’s Cloud Scanning Service that is also available via its Web site. Since the online database is updated more quickly than a local client version, it can be more effective at catching freshly released malware programs. The suite comes with a performance optimizer tool. BitDefender offers a personalized user experience that presents one of three dashboards to the user – a beginner level, an intermediate level, or an advanced level of settings. A short survey upon install will determine which one is best to start with, and the user can choose their expertise level at any time. The main page of the dashboard can also be customized to offer shortcuts to a users’ favourite software features. For example, small business users may want to make a hot link to the home network management feature, Maierean says. Other features include Smart Search, meant to be used to search for advice on how to clean or defend against a particular piece of malware. There’s also video tutorials to instruct on how to use the software. BitDefender is targeting the small home office segment with the same software it sells to the consumer market. But there’s no problem there, IDC’s Kolodgy says, small shops will get what they need from the suite. The product does include encryption capabilities, which will help small businesses stay compliant, he adds. 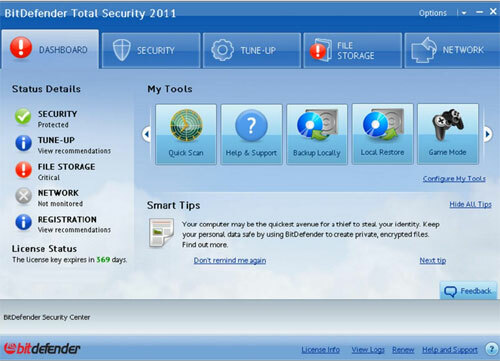 BitDefender’s Total Security 2011 suite small office edition will sell for $129.95, for five licences two years in length. Brian Jackson is a Senior Writer at ITBusiness.ca. Follow him on Twitter, read his blog, and check out the IT Business Facebook Page.